The Gathering Place – The JLD is partnering with The Gathering Place to expand and improve the current nutrition program. 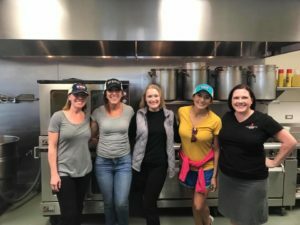 Volunteers also donate time at the Food Bank of the Rockies under a reciprocal arrangement between the two organizations. The JLD prepares four meals a month serving over 200 women. The JLD was honored with The Gathering Place 2013 Above and Beyond Award for an outstanding commitment to and support of The Gathering Place in the 2012-2013 year. We are very grateful for this community partnership!